Consider a full transport belt (both lanes) and suppose that only one lane is being emptied further down, I want to spread that demand over both lanes. The double desing is to ensure throughput when demand is high. Does anyone know of a better/passive design for this? This doesn't work in some corner cases (try to take items in output only from one side). 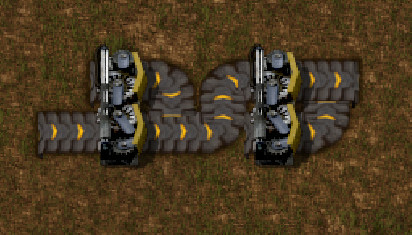 I haven't seen it not work, although I also haven't used it an awful lot in 0.12 yet, so maybe the belt changes changed some behaviour of this balancer. thanks, XKnight, that was what I was looking for. Neat way of separating the lanes. Here is what I'm using. Any of the 4 output lanes can be supplied by any of the 4 input lanes. 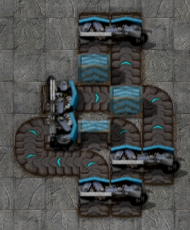 A version that is only 2 belts wide in case youre short on room between assembling machines (If you spred it out between the 2 splitter you can fit an inserter or pole in). Just realized it wasn't perfectly balanced (I just came up with this stuff). I entered the items one lane at a time and waited for them to filter to the right side before filling the next lane. First configuration is unbalanced to the odd numbered lanes (this was my original post). Second config has an equal split from each lane to all other lanes! At full load, a single odd numbered output lane draws from both odd numbered inputs (but ignores the even inputs). Same for even numbered lanes -- the individual even output lanes each draw from both even input lanes while ignoring the odd lanes. To balance the draw while under capacity, I suppose you could place two of these one after the other, but add a lane inverter between them to swap e.g. lanes 1&2. I think that would make it pretty much a perfect balancer for both upstream and downstream regardless of the load. Edit, I tried that setup (two of these with an inverter in between switching lanes 1 and 2). Each input lane was given a different item again. Of course ideally, each output lane would end up with 25% of its contents from each input lane. Always under load, I also blocked an output lane (or 3 of them) sometimes, and let the others run. I used 16K items, and the test took about 20 minutes. The lowest was 23.9% The highest was 26.6%. I realize this would only be useful under extreme conditions, but I had fun testing it out. Hmm, I notice in the wiki the design I show to be flawed is described as " evenly distribute the items onto the output lanes and 'pull' evenly from the input lanes when the output is backed up" but this is not true. It may pull from the belts equally, but not from the lanes equally. Is not perfectly lane balanced. The right lane only outputs to the two right lanes. The left lane only outputs to the two left lanes. If an input dries up, or any of the output lanes backup, then throughput decreases or is uneven. Mine is lane balanced and throughput will never decrease. It's an all in 1 converter. It goes 1 to 2, 3, 4. or 2 to 1, 2, 3, 4, etc. I'm kinda of excited because it seems my design hasn't be thought of before. Oops, you're right, I missed that the splitter is not in that section. However the one I posted a picture of a few posts ago was under the lane balancer section. It certainly pulls evenly from the lanes it pulls from, true, but it also ignores two of the lanes. For example output lane 1 pulls only from input lanes 1 and 3. The wiki page says they "pull evenly from the input lanes when the output is backed up. They are input and output balanced." Also, I'm very new to factorio. If that's what's commonly called a lane balancer then that's great. I'm not sure what to call my design then, because every lane is balanced by every lane. So for example if one of the output or input lanes is blocked / dries up, there's no change in performance. However for that other design, in my picture above I show how if output lanes 1 and 3 were to be blocked, the throughput is only at 50%. Samky wrote: Hmm, the one I posted a picture of a few posts ago was under the lane balancer section. It certainly pulls evenly from the lanes it pulls from, true, but it also ignores two of the lanes. For example output lane 1 pulls only from input lanes 1 and 3. The wiki page says they "pull evenly from the input lanes when the output is backed up. They are input and output balanced." Well that is uh... bad. I might have to change the description then, as that means that it's not input lane balanced. You aren't I appreciate constructive criticism, it helps making the wiki better. Samky wrote: Also, I'm very new to factorio. If that's what's commonly called a lane balancer then that's great. I'm not sure what to call my design then, because every lane is balanced by every lane. So for example if one of the output or input lanes is blocked / dries up, there's no change in performance. However for that other design, in my picture above I show how if output lanes 1 and 3 were to be blocked, the throughput is only at 50%. Your design would be a lane and belt balancer I guess. Perhaps I should put the lane balancers with multiple input belts into a different section on the page that is called "lane and belt balancers". The flawed design would then get a subtext that explains the problem with it. Edit: Nevermind, your design is a lane balancer. Lane balancers balance every lane (so the belts are also balanced), belt balancers balance belts and ignore lane balance. I think I will take the lane balancer section and devide it into "lane balancers for one belt" and "lane balancers for multiple belts"